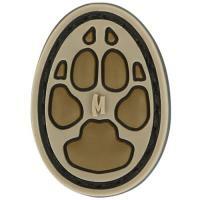 Man's best friend deserves his own patch and Maxpedition's oval Dog Track Morale Patch presents pride in your four-legged companion. Just one item in a new series of patches made exclusively by Maxpedition, the Dog Track patch boasts a love for pups in impressive detail and 3D relief. The original footprint artwork maintains its crisp look thanks to the rugged PVC rubber construction that guarantees lasting service life through regular wear. Its hook-backing attaches easily to the loop lining on Maxpedition bags and includes an additional loop fabric sheet for convenient stitching onto any accessory for ultimate customization. For more permanent display, skip the loop-backing altogether and stitch the paw print directly onto any fabric material.